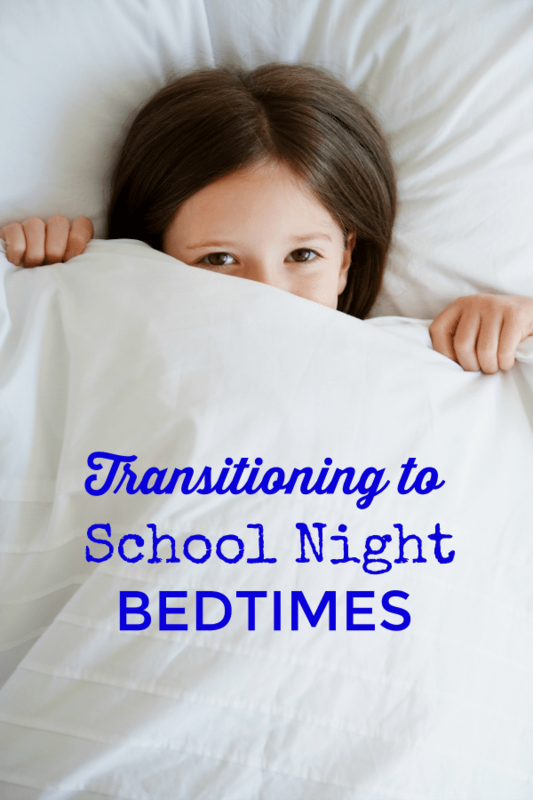 Before summer comes to an end, it’s a wise idea to start transitioning to school night bedtimes. Waiting until the last minute is usually stressful for everyone involved. That being said, here are a few suggestions to get you started. Honestly, it’s probably easier than you anticipate. Sleep experts (yes, there is such a career) recommend that you ease into the school bedtime routine, by moving your child’s bedtime back by 15 minutes every three days until it coincides with the new time you’re working toward. This means you may have to slightly alter things like bath time as well. Asking kids to turn off all electronics an hour or so before lights out typically helps them to relax. Yes, it’s easier to accomplish with younger children. But, it can be done. Even 30 minutes before is beneficial when you want to quiet things down. If your kids are small, a reward system works in all kinds of situations. This includes going to bed on time. The rewards don’t need to be huge, by any means. An extra dessert one night a week or a bit more screen time are two possibilities to consider. According to the National Sleep Foundation, preschoolers require between 10 and 13 hours of sleep in a 24-hour period… this includes nap time. And, children up to the age of 12 function best on nine to 11 hours of sleep. It’s good practice to encourage your teen to get 8 to 10 hours of sleep. These are just three simple things you can do to help your kids transition back into a school night bedtime routine. The first couple of weeks might not go as smooth as you hope. However, in this case, patience is your friend. Remember this. Some children adapt to change much easier than others. Give it time and going to bed on schedule will probably be second nature. I remember this transition time so well. Now I can only hope my kids will transition on their own now that they are in college! I try and work on a school bed schedule at least 2 weeks before school starts. If not its a struggle getting my son up for school. These are great tips. I can’t believe it is already almost back to school time! We’ve already had this discussion about sleeping in. Fortunately one of ours has cross country practice already in the mornings and she has to get up early! Such helpful tips for getting the little ones on school schedule before the school year begins! Excellent suggestions! My kids start school again in just two weeks, so we plan to begin our normal nightly routine very soon. Yes, we try to get back into the routine about a week before summer ends so that it is not too rude of an awakening- literally! I definitely need to keep this in mind for our son someday. While he is only 8 months I have friends who can benefit on this tips. Will share! Easing into the normal school bed time is a good idea to do a couple weeks ahead of time. I’ll be working on the electronics shut down before bed too this year.. Totally not easy! Setting a bedtime routine is so important for your child’s well being and health. It’s so important to get the proper amount of sleep each night! I don’t know if the 15 minutes idea would’ve worked for me. The kids would always beg me to stay up a few more minutes and somehow, at times, I gave in to them. Thank goodness I came to my senses! I was tired of telling and yelling for them to go to bed. They shared rooms so I had a hard time getting them to stop talking to each other. I decided to enforce a punishment. However long it took them to go to sleep, they would go to bed that much earlier the next night. Plus if they kept doing things, I would give a punishment equal to the offense – even grounding! Because depending on what time they went to sleep, it was harder to get them up in the morning!! These are good tips, but like everything, different strokes for different folks.